In Rasht, we had our host Javid waiting for us. We didn't have his address, but with our cell phone we managed to find him by handing the phone to random people several times. Each of our unsuspecting helpers got us a little bit closer to Javid after receiving his directions. We had a great three days with Javid, who is our age and shares an apartment in the city centre with two friends. He is freelance English teaching until his Canadian permanent residency is approved (his brother and family live in Winnipeg). In a few days we got a glimpse at the frustratingly slow process that aspiring immigrants have to go through before getting the chance to start building their life abroad. He has no way of knowing when his approval will come through but his bags are packed. We have our fingers crossed that by the time we are home in the spring he will be there too. Iranians have dinner very late by our standards (maybe because of summer Ramadan), but Javid set a new record for late eating. On our first night, the third step in the rice-cooking process began at about midnight (had we known there were three steps we would have gotten him moving a little bit earlier). 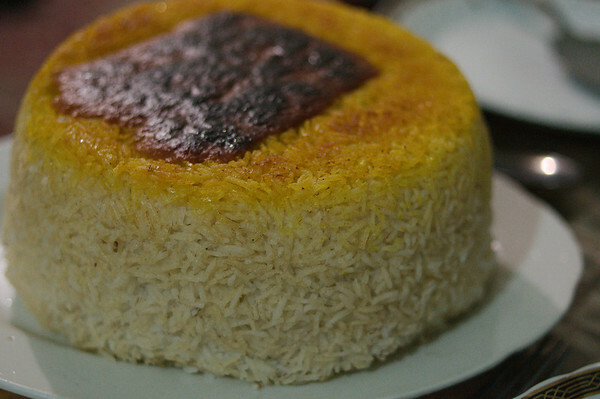 The process involved at least one hour of soaking the rice, a first cooking then a second cooking where oil is added and the rice is cooked until it forms a crispy golden brown crust on the bottom and sides of the pan. Bread or potatoes are added to the bottom of the pan to help form the crispy rice cake. 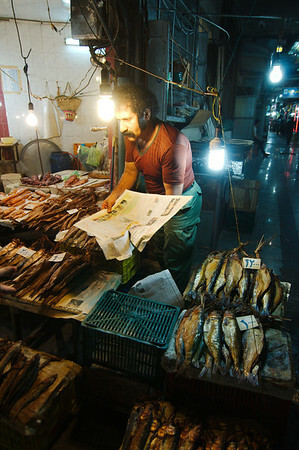 Our meals were fantastic but we couldn't help teasing Javid who was so slow and meticulous about his food preparation. 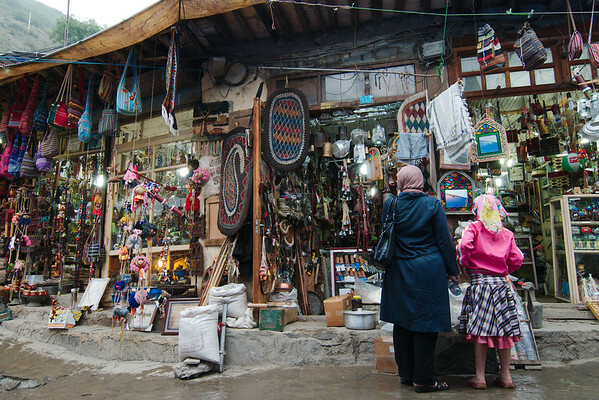 To escape the humidity of Rasht (which was hovering around the 100% mark), we took a bus to the ancient (and popular) stepped village of Masouleh. Javid considered joining us after his English classes but it rained for most of the afternoon so we agreed to meet up again the next day. 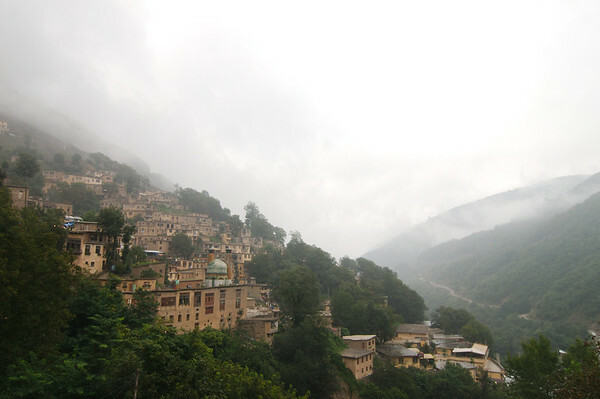 After spending the afternoon (pre-rain) sleeping on the hillside away from the crowds, we rented a room in a local house with a view over the village from an adorable old man who bargained pretty hard (he said we were getting a better price because we were foreigners - in Iran this was maybe believable). In the evening we watched the crowds disappear and the rain stop. It was one of the most relaxing days we'd had in a long time. In the morning we bought fresh flat bread, feta cheese and instant coffee and enjoyed the peace of the village before the crowds began to arrive again. From Rasht we had decided that we would head to Tehran by bus. With half of our visa time expired, we still had to get to Tehran to arrange Uzbek and Turkmen visas, then come back to the coast and continue cycling. 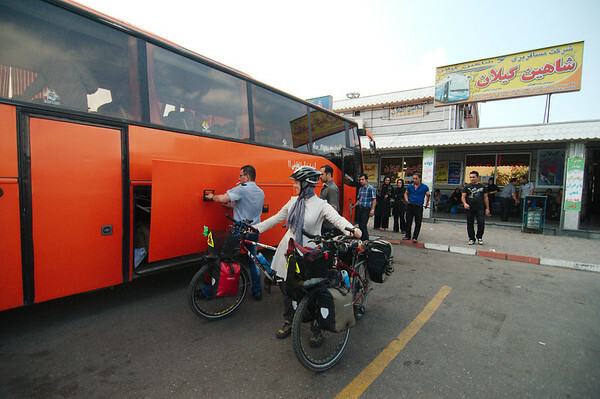 We thought of leaving our bicycles in Rasht, but decided that if the visa process was delayed we might not have enough time to meet all the visa deadlines so we would have to be prepared to get on another bus. Getting our bikes on the bus was quite an ordeal. We were greeted by an enthusiastic attendant at the bus station who helped us buy tickets and load our bicycles into the baggage compartment. Anywhere else we would have been reluctant to accept assistance without expecting a scam, but our guard down was in Iran. After we purchased our tickets and got onto the bus, the friendly attendant marched on and demanded that we pay him a fee for the bicycles, 5 times the price of a ticket. Initially we thought we had misunderstood, but when we realised what was going on, we got off the bus, unloaded all our stuff and got a refund for our tickets. Much arguing ensued, we even phoned Javid for assistance who argued on our behalf. The attendant was particularly aggressive but he was no match for me (I was of course my usual calm and collected self). Strangely, the bus didn't want to seem to leave without us. The attendant really wanted this lucrative opportunity and for some reason had the ability to hold up the bus. Eventually another employee came up and offered a bicycle fee of only 2 times the price of a ticket, we didn't know if he had any authority to make the offer but we agreed and reloaded our bikes. We had held up a bus full of passengers for almost 30 minutes. The employee who offered us the discount turned out to be the bus driver, who himself was also being held up by the attendant! What a strange arrangement. 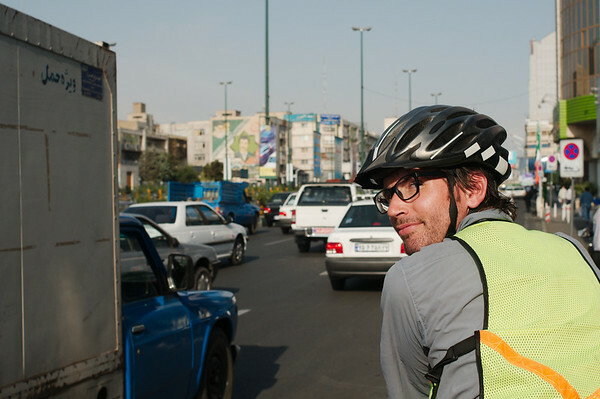 Tehran is a monstrous, sprawling city and we arrived at the Azadi bus station 10km from the city centre. After our unfortunate bus experience we decided that the simplest way to get to our hotel was to cycle and despite the crisscrossing expressways and insane traffic, we managed the ride with relative ease. The dense traffic actually worked to our advantage because for most of the ride cars were stopped bumper-to-bumper. We followed the hundreds of motorcycles and weaved passed cars using the outer lane. 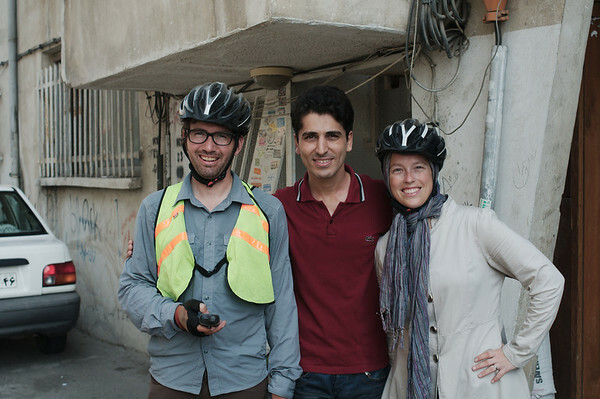 After successfully tackling the cycling nightmare that is Tehran, we were pretty confident we could handle anything. Emilie-you look so cute in your outfit. We had help from our friend in Rasht who negotiated our ride to Masouleh for us, so my apologies, I don't have much info for the way there. However we had no trouble getting back to Rasht on public transport, there were lots of options and many Iranian tourists who can help out. 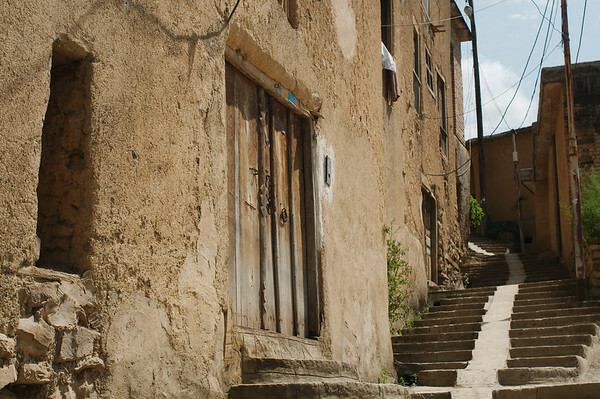 We loved Masouleh and I would definitely recommend the trip. Also we had no trouble finding a lovely cheap room in Masouleh once we got there, no advanced planning required. It's amazing to stay the night because most of the tourists leave and the village becomes so beautifully quiet and picturesque.